(Fortune) -- If not for founder Mark Zuckerberg's stubborn streak, social-media pioneer Facebook might be just another part of a giant media or tech outfit today. Instead it's a giant on its own, with close to 500 million users, some $20 billion in market value, and millions of investors eagerly awaiting an IPO. For his new book, The Facebook Effect: the Inside Story of the Company That Is Connecting the World, Fortune contributor David Kirkpatrick gained unprecedented access to the company and Zuckerberg, who turns 26 this month. In this adapted excerpt, Kirkpatrick reveals Zuckerberg's turmoil as he resisted takeover offers from a parade of moguls. The Viacom executive figured he'd impress the kid with a ride on the company jet, but clearly it was the youth who was in the driver's seat. Of all the suitors courting Mark Zuckerberg in the fall of 2005, one of the most enterprising was Michael Wolf, president of Viacom's MTV Networks. He had heard college students in MTV's focus groups talking incessantly about the new site, and he was determined to snag it for his parent company. But first he had to "friend" Zuckerberg. Wolf had figured out that the best way to reach the Facebook leader was to instant-message him, so he IM'd Zuckerberg periodically to say he planned to be in Palo Alto -- whether it was true or not -- and suggest a dinner. If Zuckerberg agreed, Wolf would fly out. But as the end of the year approached, Wolf got in touch with a better offer. He was planning to be in San Francisco with the Viacom corporate jet, he claimed. Would Mark like a ride back to New York for the holidays? Zuckerberg took Wolf's bait. Since Viacom's corporate planes were in fact unavailable, Wolf chartered a top-of-the-line Gulfstream V for the trip from the San Francisco airport to Westchester County Airport, near Zuckerberg's parents' home in Dobbs Ferry, N.Y. Wolf flew out that morning from New York on American Airlines (AMR, Fortune 500). The MTV executive was waiting aboard the G5 as if it were the most normal thing in the world when Zuckerberg arrived, late, about 5:30 p.m. Then, as Wolf had shrewdly planned, they spent five uninterrupted hours together aboard the plane. He was resolved to find a way for Viacom to buy Facebook. For much of the trip, however, the 21-year-old was in control of the conversation. He interrogated Wolf about MTV's business. How did companies like Viacom make their money? How much did MTV charge for advertising? How do you build your audience? During the trip Zuckerberg took to admiring the G5. "This plane is amazing," he said. "Maybe you should just sell a piece of the company to us," Wolf replied. "Then you can have one for yourself." Wolf invited his guest to sit in the jump seat in the cockpit as the powerful jet landed at Westchester. When it pulled up to the private aviation terminal, two cars were waiting. One was Wolf's corporate sedan to drive him into the city. The other was the Zuckerberg family minivan, from which Mark's parents emerged. They beamed and gave their son a big hug. It was as if he were merely coming home from a semester at college. The MTV president kept up his pursuit after the holidays, flying to Palo Alto in January with an elaborate PowerPoint presentation and again the next month with a more personal appeal. He and Zuckerberg were becoming chums. They took a long walk around the palmy, well-groomed streets and stopped by Zuckerberg's one-bedroom apartment. The place was messy, with a mattress on the floor, piles of books, a bamboo mat, and a lamp. Then they headed for dinner at a nearby restaurant. Wolf popped the same question he'd asked on the plane. "Why don't you just sell to us?" he asked. "You'd be very wealthy." "You just saw my apartment," Zuckerberg replied. "I don't really need any money. And anyway, I don't think I'm ever going to have an idea this good again." Viacom (VIA) would try money nonetheless, with a cash offer of $800 million and provisions that could make it worth as much as $1.5 billion. But like many other suitors, the Viacom executives discovered they were dealing with a formidable character. If his invention's early appeal was at a freshman level, exploiting the desire of college students to check each other out, his professed ambition was much higher: to change the world. 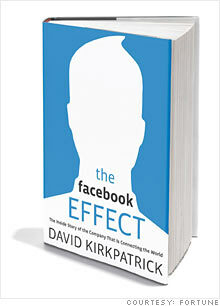 Read the full excerpt from David Kirkpatrick's The Facebook Effect. The Facebook Boys: Where are they now?